I've put together the new Azog miniature along with Yazneg - a character that was respelled by GW shortly after the Hobbit started out as a tabletop game. I guess the designers thought that they need to release a few named orc leaders/heroes to make up for lack of them in the evil forces. Good idea, not only from the marketing perspective but also from a hobbyist one as it gives a chance to work on more nicely designed miniatures. I didn't really like Yazneg when I saw the codex picture. He seemed way too static and his armor lookes pretty ridiculous to me. I changed my mind after putting him together and mounting him on a larger rocky base with a slightly altered pose. I used a few pieces of cork and plenty of GS to make it look like one big boulder. You can see in the pictures below that the Warg's legs are stretched further than the edge of base so I needed to take that into account while putting the rocky base together. Azog is a different story. I liked the miniature the moment I saw it, at least the mounted version. I had mixed feelings about the one on foot and still don't feel good about it. You'll notice in the pictures that he's much larger than the version mounted on a Warg, his chest in particular is significantly bigger. 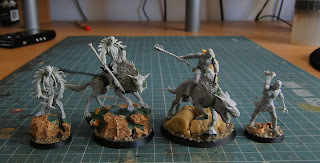 I also had some problems putting the large Warg together. The beast is cast in two halves and they didn't fit together well. I needed to put it in hot water, bend it to the proper shape and then out it in cold water to save it in the desired shape. It wasn't too much trouble but it's disappointing that more than two years after the introduction of Finecast (despite an overall improvement in quality) the same problems still make putting these miniatures harder and less enjoyable. The mounted version of Azog features a base that is larger than a regular cavalry one. It seemed empty when I put the model on it so I added a ruined column. I think it fits the base nicely and it also can also make one think of ruins among which we see Azog in the movie. The foot version is much more static and less interesting. It's also so tall that I decided not to use any additional material on the base as it would make Azog look too tall. so they give you a base that is bigger than 40mm for a 40mm cavalry per the rules? To be honest, don'r know the rules of this game. Perhaps Azog is somewhat special and that's why he's on a larger base + he gets extra rules.